Ah, house hunting. It can make or break relationships. When facing such a large purchase, emotions can run high. Add the stress of a condensed timeline, geographic distance, and all the other variables of military life, and it can be a recipe for disaster. Step number one is agreeing on some basic criteria for your new home—before you even start searching through home listings. So what happens when you are dead set on buying a charming historic home, but your spouse has a preference for new construction (and an aversion to home repairs)? You’re probably in for some trouble in paradise, that’s what. This should be an enjoyable and exciting purchase for both of you! 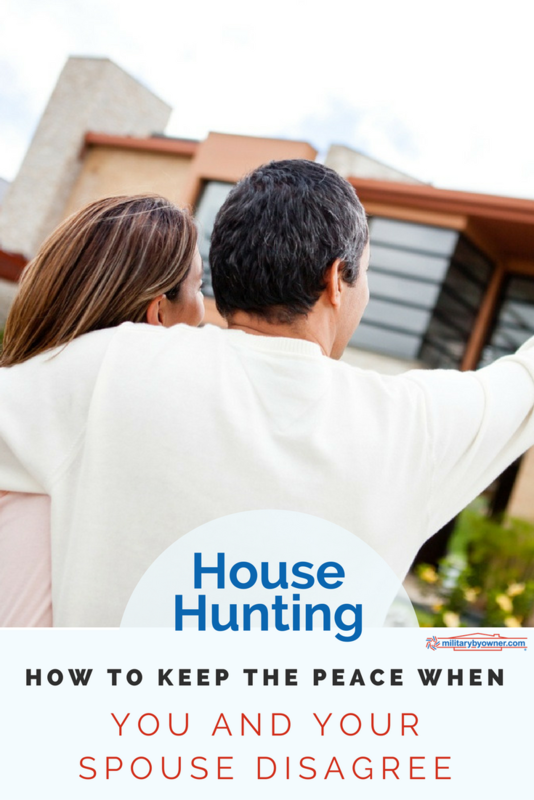 In order to make that happen, here are some practical tips to communicating and finding agreement when it comes to house hunting (and buying) as a couple. You both need to be sure you’re on the same page, literally. Try writing out your separate “must have” lists. Do you want an open floor plan and your spouse has to have a garage? Great! Non-conflicting items are easy to agree on. Decide that you each get one non-negotiable item on the list (And, no that can’t be “give mama whatever she wants”). Do your best to go through each item one by one and combine them all on one sheet of paper, in order of agreed-upon priority level. Be sure to clarify wants versus needs! This will be tremendously helpful in determining what your joint goals are going to be, as well acting as a great tactile exercise in compromise. For better or worse, remember? You can do this! I will be the first to admit that I have been guilty of falling head-over-heels in love with the wrong house. If you’re emotionally attached to a home when it’s all gussied up for the showing, you’ll be more likely to overlook some of the issues that might be unveiled during the inspection. You have to take emotion out of this transaction! You also need to be wary of letting your eyes be bigger than your wallet. Go into the home buying process with a clear head and research all of the potential expenses associated with the purchase. You’re going to need to look at insurance, taxes, utilities, HOA fees, and a whole host of other monthly expenditures that add up quickly and price you out your “dream” home or neighborhood. If you as a couple can go into the process as a united front, you are less likely to fall for a “siren” home that leads you towards financial disaster. Sometimes, it may be best to call in objective help. Listen to real estate savvy friends and the professionals advising you through the process. A knowledgeable real estate agent can help give you some perspective and make non-emotional decisions. They also advocate for you and negotiate on your behalf. They’ll be the first to tell you if the home you have your heart set on is overpriced for the market or comes with other considerations you may not be clued into. Remember that list we made at the beginning of the article? Grab that bad boy and show it to your agent. They'll be able to spot things right away that could be utterly unattainable on your budget or for your locale. If you want views of the water and your spouse wants a loft downtown, BUT you can’t afford either of those options, then there’s no fight worth having! An agent can point out these irregularities quickly and without further argument. Disagreeing over a home is not worth marital disharmony. And honestly, if you’re having a hard time agreeing with each other this early on, the rest of the process could be pure torture. After you agree on the home, you still have to go through the offer, negotiation, contract, lender approval processes and closing! You need to agree on every single one of these items. If, after all this, you still can’t agree, it may be wise to take a step back and hold off on a major purchase. Don’t let the pressure of the market, an impending TDY or deployment, or any other life stressor force your hand when you’re not ready - and definitely not if it causes discord. Should Military Families Buy or Rent a Home?